Old and unused sinks can be reused into outdoor fountains or planters for flowers. They can be decorated with a mosaic or used as it is depending of the rendering you want. The faucets can be removed or kept to direct the fountain water flow for example. 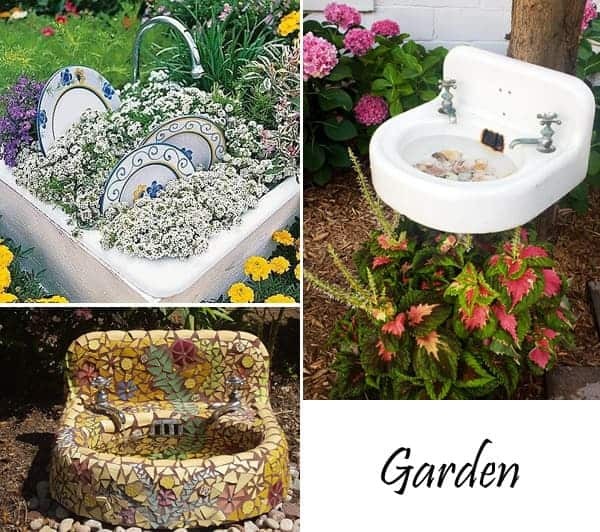 Do you have already turned your old sinks into something decorative in your garden? More information: Furnish Burnish website ! I took our old kitchen sink, built a “cabinet” for it, put it on our patio and have wave petunias overflowing out of it. Jessica Wall. 2 left hand side pics ?